Welcome! Today is a sad post because it’s my last ever for the Alley Way Stamps. In case you didn’t know, TAWS is going to close their doors in the new year. The good news for you is that their stamps are on sale for a great discount in case you’ve been eyeing any sets. For today’s card, I wanted to create a simple and elegant winter card. As always there is a how-to video to share. You can watch the video below, or over on my YouTube channel. Contributing to the Alley Way Stamps design team has been an outstanding experience. I have been continually inspired by the incredibly talented designers that I have been given a chance to work alongside and I am so grateful for the opportunity. That’s it for me today. I’m going to take a few weeks off for a move and to spend time with my family over the holidays, but I will be back in the new year with plenty of new cards and videos to share. Merry Christmas everyone! Happy holidays, crafty friends. Today I’m on the Alley Way Stamps blog sharing a festive penguin Christmas card. Nothing says the holidays quite like a festive penguin. Am I right? Anyways, as always I have a how-to video to share for the card. You can watch the video below, or over on my YouTube channel. I really like the Penguins on Parade set because it’s so versatile. I used the exact same stamp set to create a Halloween card not too long ago. Hi everyone! Today I’m going to share a set of clean and simple holiday cards using supplies from Lawn Fawn. As I’ve mentioned recently, this holiday season has been a very busy one for me, so I’ve been short on time. 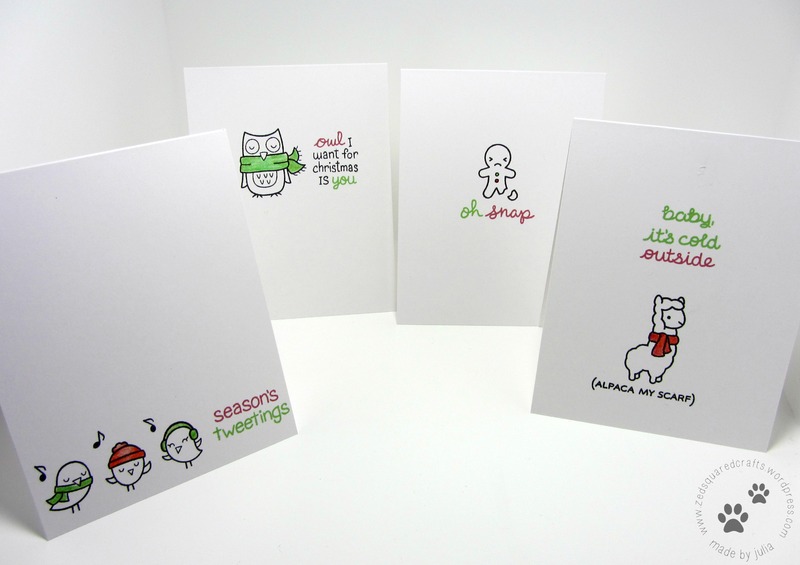 I still wanted to create and send some handmade love to friends and family, so I came up with these CAS, but adorable cards. I have a how-to video to share. You can watch the video below, or over on my YouTube channel. These cards were simple to make, but have enough detail and sparkle that I think they are special enough to share. I think next year I may recreate these designs to give away as little sets. Welcome! 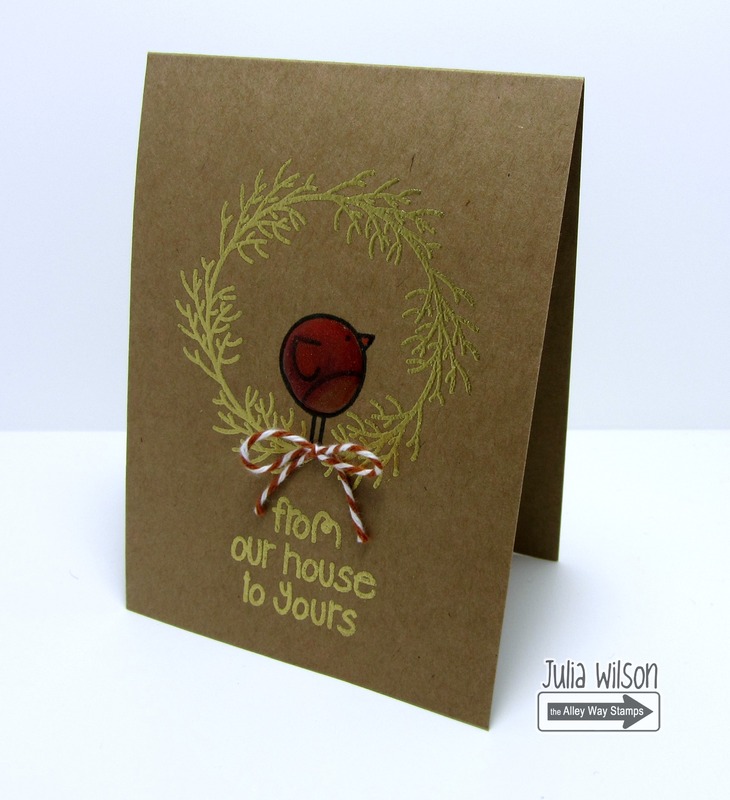 Today I’m over on the Alley Way Stamps blog sharing another holiday card. Just like I’ve been doing all season, this one is easy and quick, and perfect for any last minute cards you may need. You can watch my how-to video below, or over on my YouTube channel. Like I mentioned, this card was a breeze to create, but it still allows me to pass along a little token of handmade love over this holiday season. Season’s greeting crafty friends! Today I’m on the Alley Way Stamps blog sharing a Christmas card. You can watch my how-to video below, or over on my YouTube channel. Since my card is fairly simple, I wanted to make sure that I incorporated some small details. To cut the round shape at the bottom of the card base, I traced a bowl and then used scissors to cut the curve and around the poinsettias. If you had a round die you could use that to partially cut the curve. That’s it for today. Enjoy your weekend!